V. Luzuriaga - Tafalla is a company with more than 30 years experience manufacturing engine blocks and cylinder heads. Since its founding in 1969, it has been adapting itself to our clients' growing requirements. With a staff of 800 and an installed production capacity for 100,000 tonnes per year, we currently manufacture 1,350,000 engine blocks for automobiles and 125,000 industrial blocks and cylinder heads per annum. Fagor Ederlan Tafalla installed 4 modules Tricept T806 for deburring engine part for industrial vehicles. The system was configured of two cell, each of them with two tricept robots installed at 45º and working cooperatively in the part. 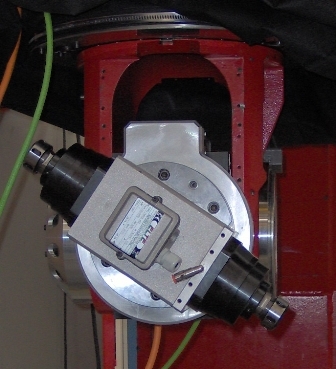 The engine part was also installed in an additional rotary axis. 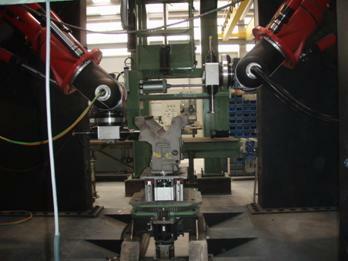 Each of the Tricept robots were equiped with a double end spinde so the tool change could be quickly done with the sixth axis of the tricept robot. The cell is substituting the man power required to debur the engine parts. Man power were using pneumatic hammers to do the debur job, which in turn could cause harmful problems in the users. By using the automatic Tricept system these problems have dissappear, obtaining a repeatable quality in the parts independently of the user. They can machine more than 14 different engine part geometries, the system being intelligent enough to detect differences between sucesive engine parts. Other solutions such us articulated robots were evaluated in the system, but they could not achieve the needed stiffness to debur cast iron. A speed of mor than 120 block per hour is now in place. Also, the ability of the Tricept T805 to make accurate machinings make it possible to machine reference points and also, in the future, make premachining on the same cell where the part is deburred.